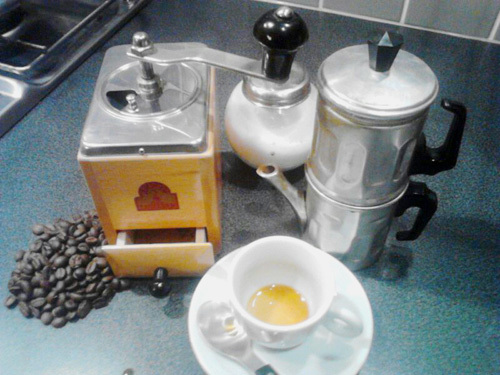 How to make coffee with a Neapolitan coffee maker. Making "upside-down" coffee with a Neapolitan coffee maker. The Napolitan brewer on the right, with a hand coffee mill on the left. The Neapolitan coffee maker looks a bit odd. When you’re heating it on the stove, it looks like it’s upside-down, with the coffee spout pointing down. It was invented in 1819 – almost 200 years ago - by a Frenchman named Morize, but then became wildly popular in Italy, notably in Naples. Unlike the other popular Italian brewer, the Bialetti, this brewer doesn’t push water through the ground coffee under pressure as the water heats. Instead, you heat the water, then turn the whole thing upside down, off the stove, and the hot water drips through the coffee. In that sense, it’s more like a drip brewer. There are three parts to the brewer. 1. A water chamber at the bottom. 2. A coffee filter chamber with a perforated lid that screws on. 3. And the serving pot, with a lid, handle and spout. When making coffee, you first fill the water chamber with water, to just below a small hole in the side. 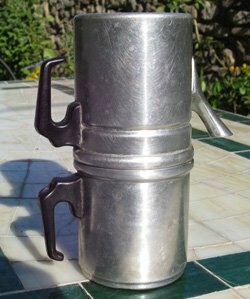 The Neapolitan coffee maker in its upside-down position, with the water chamber at the bottom. Next, you fill the filter chamber with medium ground coffee, insert it into the water chamber and then attach the serving pot to the top. Now wait for the water to boil. You'll know because there is a small hole on the side of the water chamber, at the top. When water and steam bubble out of the hole, the water is boiling. Now take it off the heat, turn it upside down and place it on a board or mat. Once the hot water has finished dripping down through the filter – which lies between the water chamber and the serving pot - you take off the now upside down water chamber, pull out the filter chamber and place the lid on the coffee pot. I have never actually tasted coffee from one of these brewers, but apparently it’s very rich and smooth. And there is no doubt that it’s a unique looking system. But I can’t help feeling the whole thing is kind of weird and perhaps overly complicated. If you want to give it a try, there are plenty of these brewers for sale at Amazon.com. Some are fairly basic and very reasonable when it comes to price. Others are a lot nicer looking, with a price to match.